We search the murky back waters of youtube to find full concerts and post them to the site weekly, come back every seven days to help us celebrate Full Show Friday's. These shows are of varying quality and may not be here for long so enjoy them while you can...As always, please support the artist every which way, but especially by seeing them live (if they are still playing)...This week...The Allman Brothers Band! Some months our Full Show Friday's will focus on specific artists, years, venues, festivals or some combo of it all. This month we focus on summer concert standby's who always played the picturesque Saratoga Performing Arts Center over the years. August always makes RtBE think of upstate New York, specifically the town of Saratoga. Going to high school just a few miles from the town, we would spend many August days at the beautiful horse track and hot nights in the state park watching bands from all over. A few years back we presented shows from the venue itself This month we will highlight some bands who always seemed to roll through and we (mostly) got to see live. Well we will start this loose Full Show Friday concept month with one of the all time great live acts who seem to get better and better when the sun was shinning on them. Maybe it was their southern roots, or the blue skies but the cosmic energy seeped into things; no one can ever say this band wasn't a joy when they were hittin' the note. 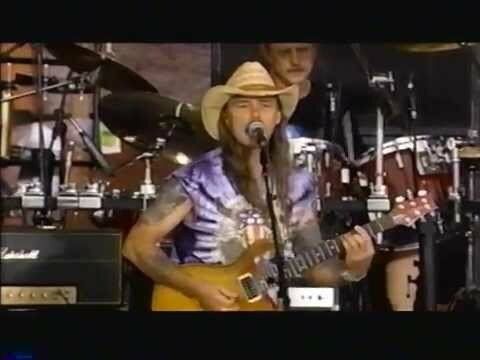 We caught them once at SPAC in their latter day lineup with Warren Haynes and Derek Trucks dueling on guitars, but here in their '94 version you get Dickie Betts and the thunderous Allen Woody on bass (along with the always amazing Haynes). Just a few ours south of Saratoga in the odd, revamped, Woodstock '94, which our friend Clancy worked at...strange days indeed. Dylan Cover #339 Rob Paynter "Tempest"